Tucked inside the user guide is the software and driver DVD. 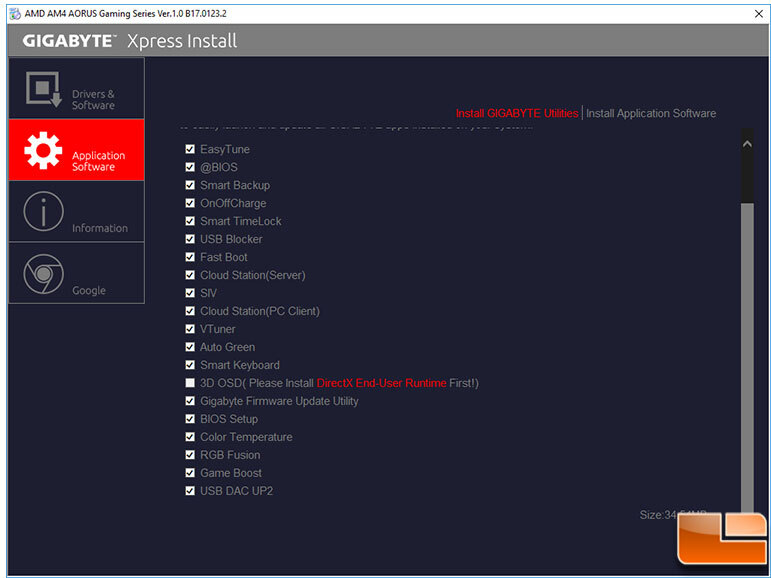 If you have seen any of Gigabyte’s latest motherboards, this installer will be extremely familiar to you. 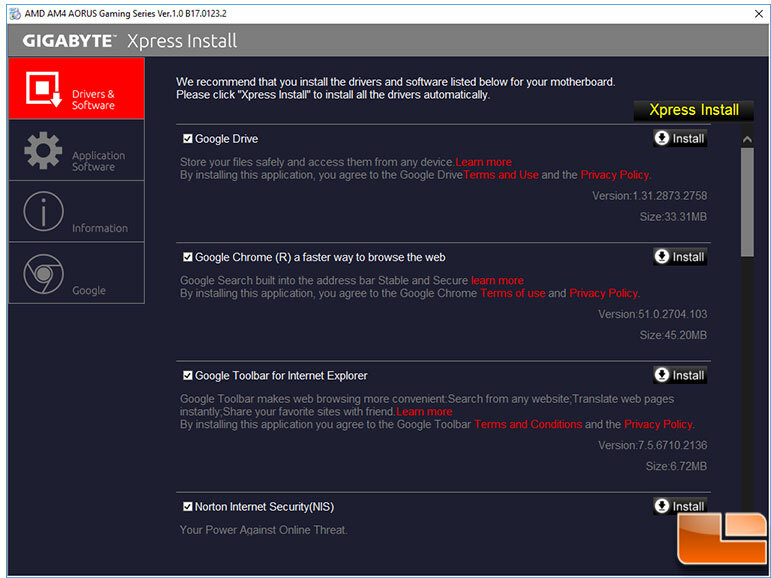 This is the same installer and toolset that we have looked at in the past. 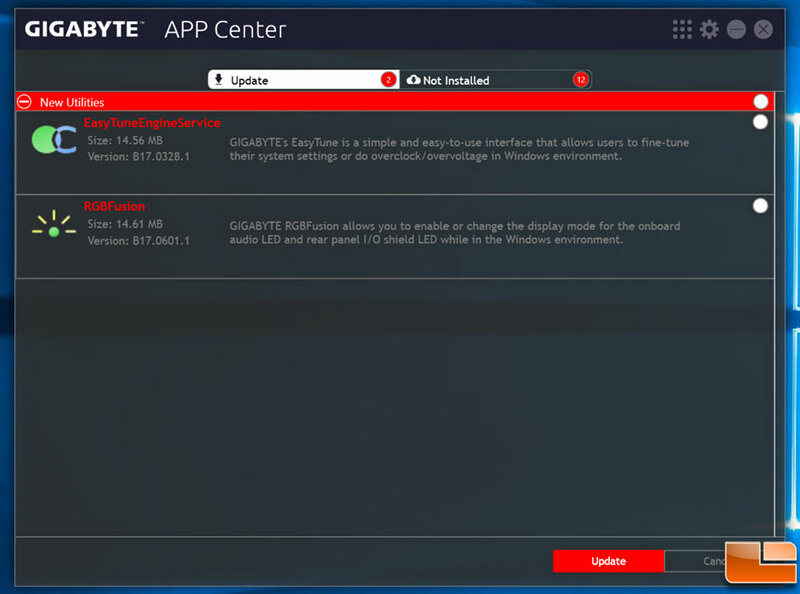 Here Gigabyte has made it easy to install all the necessary drivers, and many extra applications to get your system up and running to it’s fullest potential. The first option is to install various software and drivers. Here you can pick and choose which you want to install. Some of the non Gigabyte specific software included is Google Drive, Google Chrome, and Norton Internet Security. If you scroll below the software, you’ll find the drivers that are included on the DVD. You can install specific drivers, or install everything with a single click. Keep in mind that drivers are most likely out of date, so you are always better off getting the latest drivers from the motherboard support site; which can be found here. The next important tab is the Gigabyte specific software, which is very familiar if you have used Gigabyte motherboards and their tools. Like the other software and driver tab, you can install just the tools you want to install. While we only selected a few tools to install, there are a large number of them you can choose. 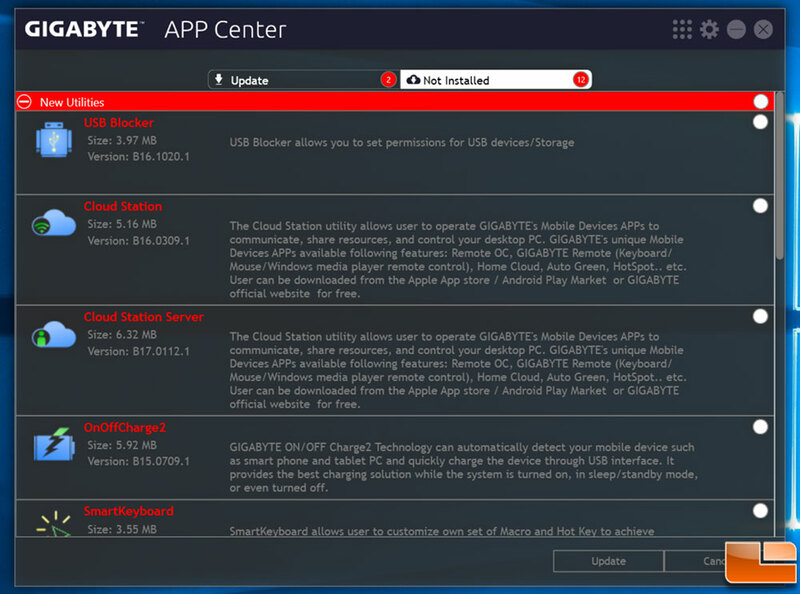 Any of the Gigabyte specific tools you choose to install, gets installed into their App Center. It is a nicely laid out screen giving you easy access to the tools. 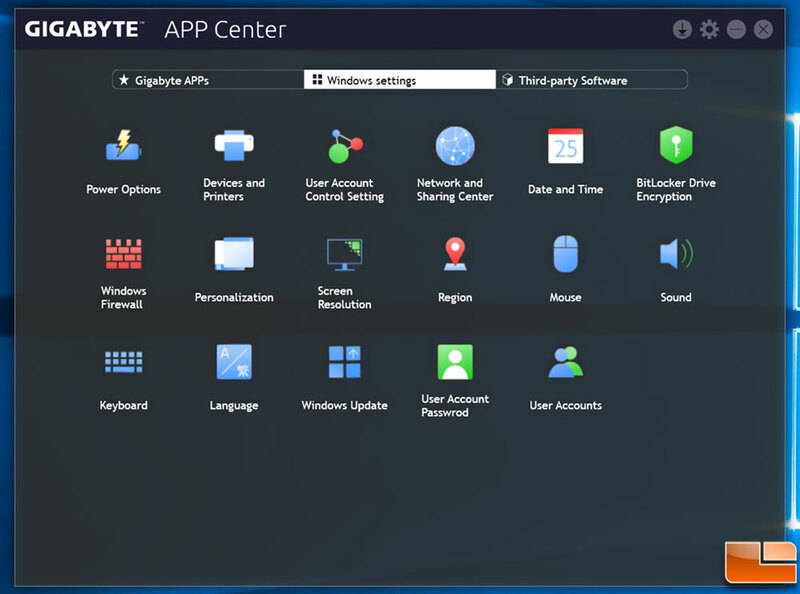 Not only does it give you options for the Gigabyte apps that are installed, it also allows you a place to change some Windows settings, similar to Control Panel. 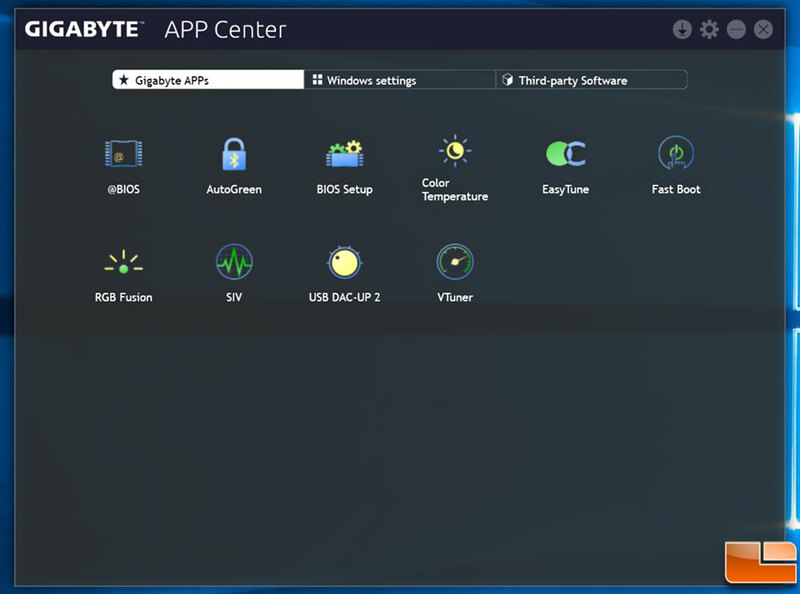 In the upper right corner is a little down arrow button, this button is their Live Update menu, here it’ll make it easy for you to check the motherboards support site and get the latest software and drivers; along with installing additional Gigabyte apps that are not installed. 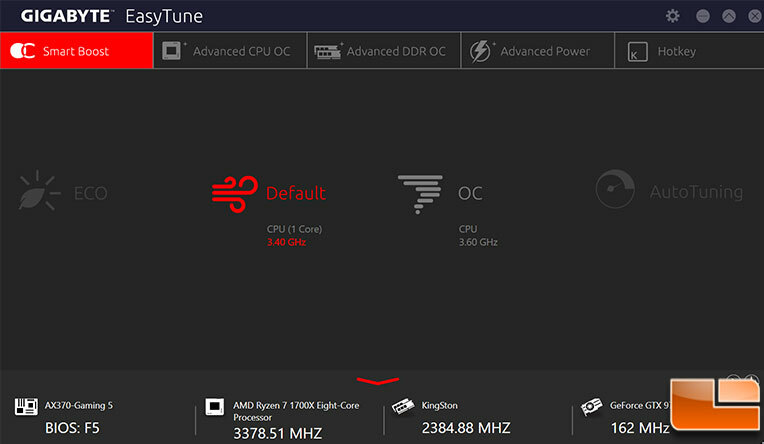 The RGB Fusion app within Windows is much more powerful than the one within the UEFI. 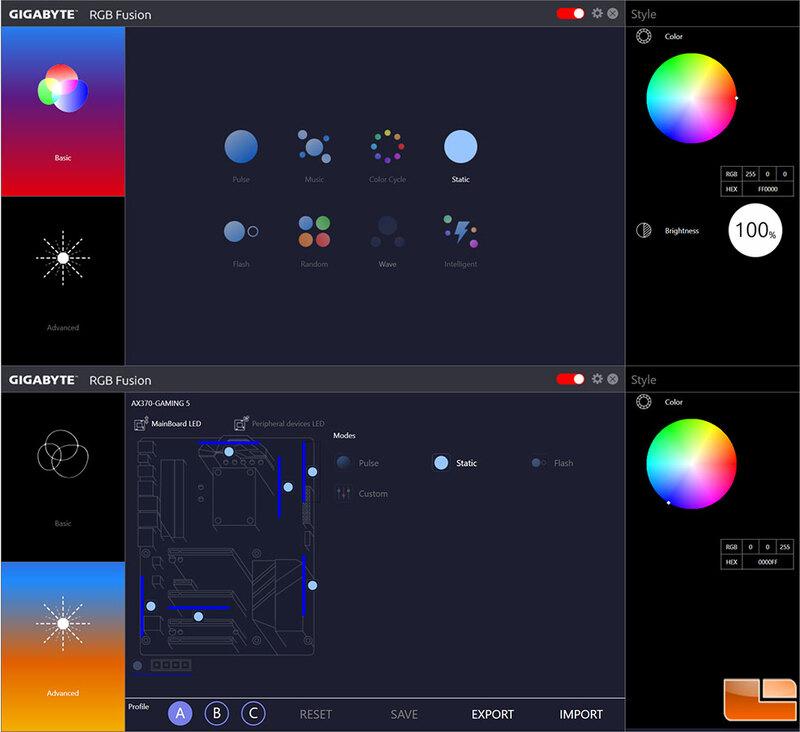 Here you can do individual color schemes for the six LED zones, plus one for the RGB LED strips. On the latest version of the app there is a new section for Peripheral Devices LED. This allows you to control the RGB LEDs on various peripherals, assuming they are compatible with Gigabyte’s system. 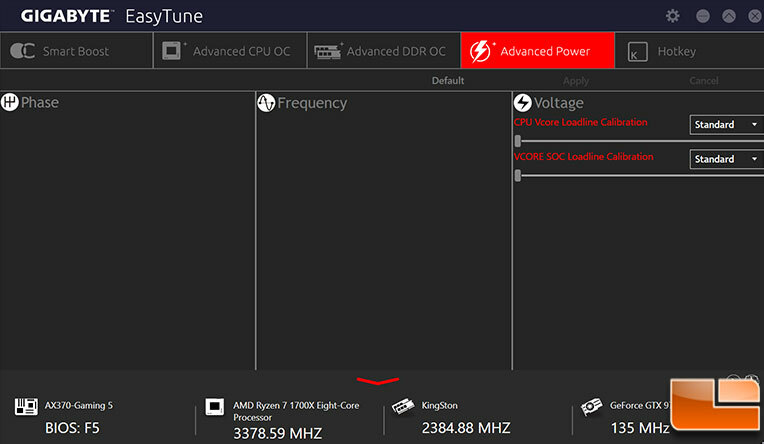 While you can do your overclocking withing the UEFI, there is also the Easy Tune application which will allow you to do it within Windows. There are several preset modes , which will get you running quickly, or you can do the “Auto Tune” which will reboot your system several times to try finding the best overclock. 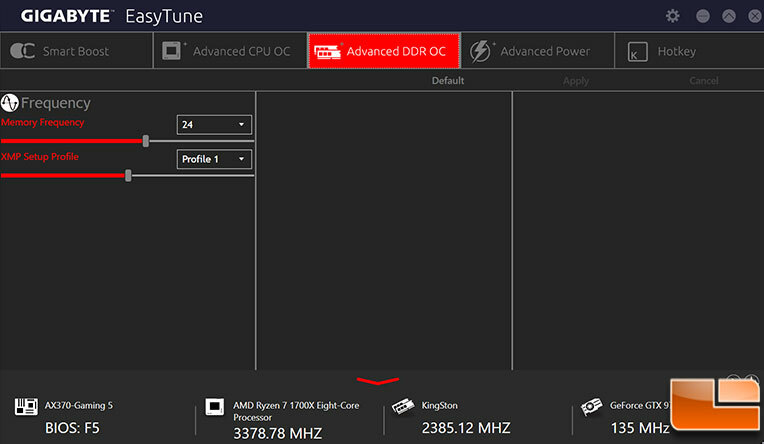 If you want to do some fine tuning within Windows, you can use the sub-menu’s which provide a small range of options to do your overclocking. The CPU sub-menu for example, provides a way to adjust the CPU Ratio and do some Voltage adjustments. While the DDR sub-menu allows you to enable the XMP profile, or manually select the memory frequency. 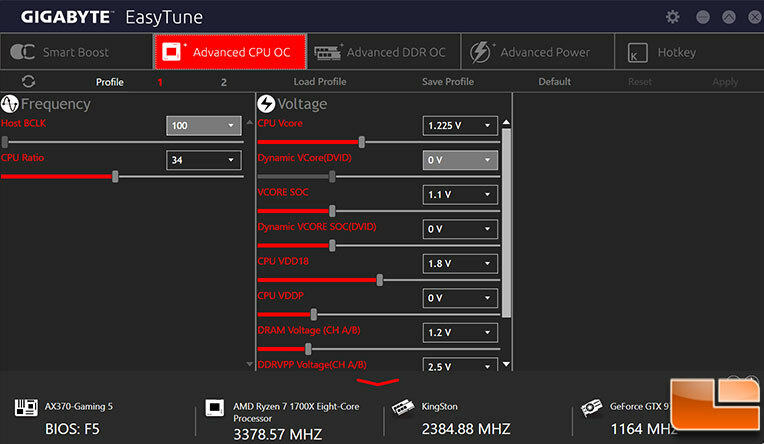 Finally, the Advanced Power sub-menu, provides just two Voltage options, the Loadline Calibration for the CPU Vcore and VCore SOC.